There was a startling moment early in the second hour of “Springsteen on Broadway” at the Walter Kerr Theatre in New York City on Saturday night: Bruce Springsteen sat down at the piano, pounded out the opening notes of his barn-burner “Tenth Avenue Freeze-Out” and then looked quizzically at the audience, which had been quietly enraptured for most of his remarkable show. “It’s OK to get excited,” Springsteen said with a grin, prompting a roar and a hefty amount of “Broooooce”ing. His comment gave the show a jolt, but since when does the audience at a Bruce Springsteen show need permission to get rowdy? If the greatest live performer of his generation has to tell his audience it’s all right to make noise and have fun, doesn’t that mean something’s wrong? Nope. In the case of “Springsteen on Broadway,” it means something is very, very right. If the audience on Saturday night needed a cue to snap out of their rapt silence, it’s because Springsteen had created a air of intimacy so all-encompassing that his fans didn’t even cheer for the opening notes of old favorites like “Thunder Road” and “The Promised Land” lest they break a mood of unparalleled delicacy. That is perhaps the most surprising thing about the show, which opened on October 12 and is booked through February. Nearly 50 years after he came out of New Jersey with a batch of wordy songs and a drive that would make him an icon, Springsteen is doing something that feels wholly new. As a fan for virtually his entire career, I wasn’t sure that was possible. I’ve seen him in smaller places than the Walter Kerr Theater, which only seats 970; I’ve seen him play acoustically nine times over the years; and I’ve seen plenty of Springsteen shows full of stories about his growing up, which he told regularly in his early days. But “Springsteen on Broadway,” which draws partly from his song catalog and partly from his recent autobiography, “Born to Run,” manages to be revelatory not only to casual fans — “wow,” the man behind me said after almost every song in the first half of the show — but also to diehards. It does so by forging a new approach for Springsteen, by using the songs to back up and illustrate the stories he’s telling, and mixing them into a seamless tapestry that brought many audience members to tears. He spends the first few moments onstage talking to us, not singing to us — and when he moves into his early song “Growin’ Up,” the youthful bravado and brazen mythmaking are set off by the introspection and confession (“I come from a boardwalk town where almost everything is tinged with a bit of fraud. So am I”) that preceded it. Where Springsteen sometimes races through that song in his E Street Band concerts, he sinks into it and caresses it in “Springsteen on Broadway.” He does that with the other material, too, using a heartfelt “My Hometown” to punctuate stories about his childhood home, a haunted “My Father’s House” to detail his conflicted feelings about his dad, a rapturous “The Wish” to pay loving tribute to his mother, a gentle “Thunder Road” to capture the glorious sense of escape he had when he first left his hometown. The songs are not chosen because they’re hits — some are, some aren’t — but because they’re key to the story he’s telling. If Springsteen’s shows have always had elements of autobiography, they’ve really been about the people around him — but this show is about the person inside him first and foremost, and then by extension about the rest of us. Much of what he says comes from his book, but it’s been rearranged and tailored to fit this form in a way that turns the neat trick of being both eloquent and conversational. After the opening half hour, it gets more thematic and less chronological; it’s an evocative and moving portrait, but not a complete picture by any means. You don’t get the full measure of his conflicts with his father, and he says nothing about the crippling depression that has affected him throughout his career. 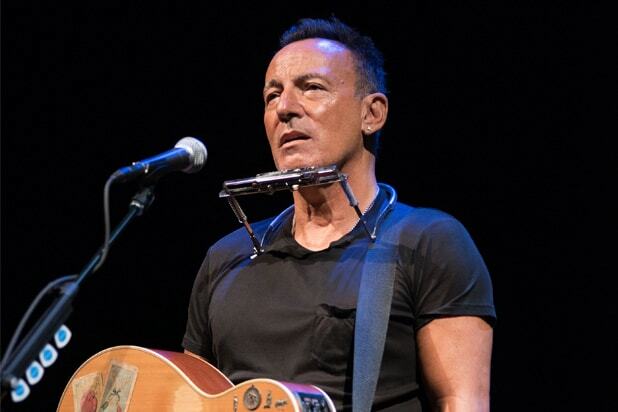 Sure, there was some of the old Bruce on the stage of the Walter Kerr, particularly after things loosened up with “Tenth Avenue Freeze-Out” and he was joined by his wife, Patti Scialfa, for a pair of tender duets. In the homestretch, “Long Walk Home” was a sobering rejoinder to today’s divisive politics, “Dancing in the Dark” a nod to his arena-rock days and “Land of Hope and Dreams,” as always, a glorious way to bring it all back home. It was a breathtaking moment, which led into a tender recitation of the Lord’s Prayer (once a Catholic, always a Catholic), and then into his signature song, “Born to Run.” In 1988, when Springsteen performed acoustic versions of this rock anthem on his “Tunnel of Love” tour, the solo arrangement was muted; the song was an elegy, a ghost of itself. But the “Springsteen on Broadway” version of “Born to Run” has a drive and lift to it. Just as he found his old neighborhood rife with the spirits of those who have gone, the acoustic bones of this “Born to Run” are alive with our memories of the ringing electric guitar riffs, the charging drums, the sax solo — hell, the glockenspiel is in there, too. There’s a life, a journey, a community, an entire history in this “Born to Run.” And then Springsteen brings it all down to a tender, intimate coda: One man standing alone, strumming and tapping on a guitar, telling his story — our story — in a way he’s never done before.